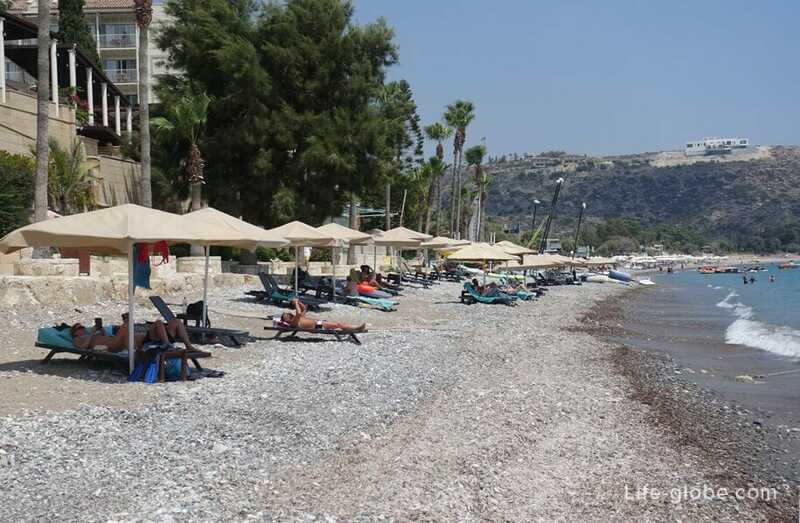 The beach of Pissouri or Pissouri Bay beach is a beautiful and stunning natural beach, located near the town of Lemesos (Limassol), in a little-known and eponymous village of Pissouri. 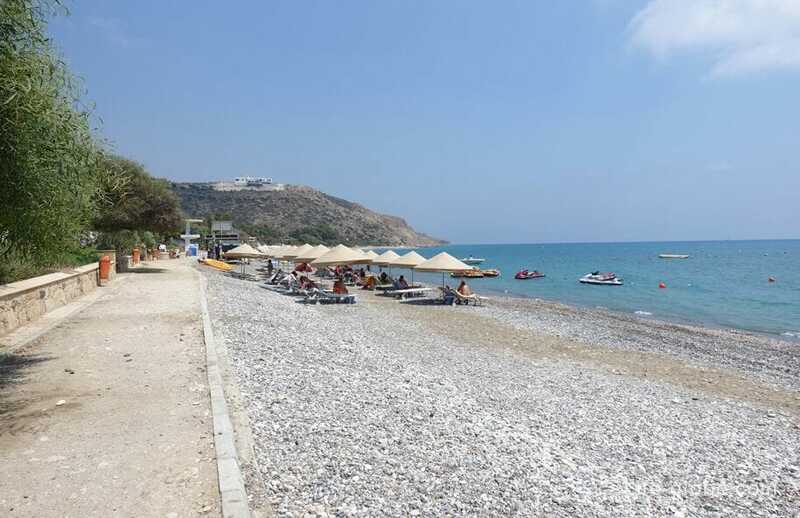 Is Pissouri beach on the southwest coast of Cyprus, between Limassol and Paphos, at a distance of approximately 37 kilometres from the historic centre of Limassol and 42 kilometers from the centre of Kato Paphos. 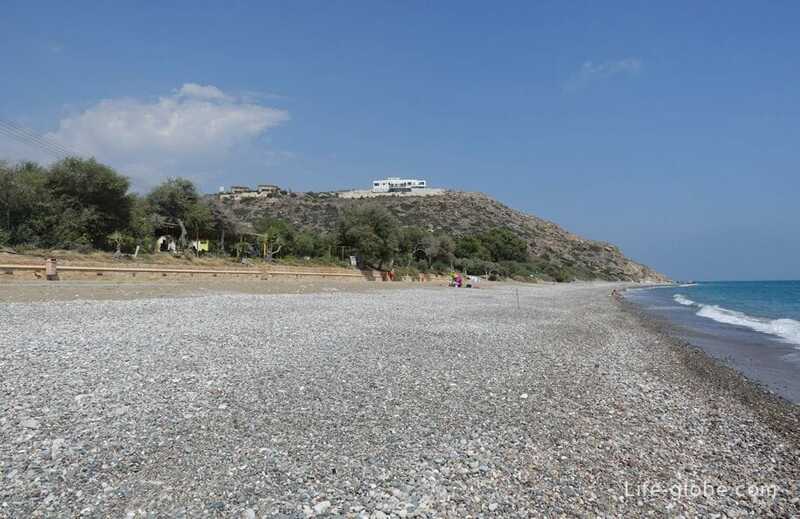 The beach has been awarded the "Blue flag" - a sign of cleanliness and quality of beaches and seawater. 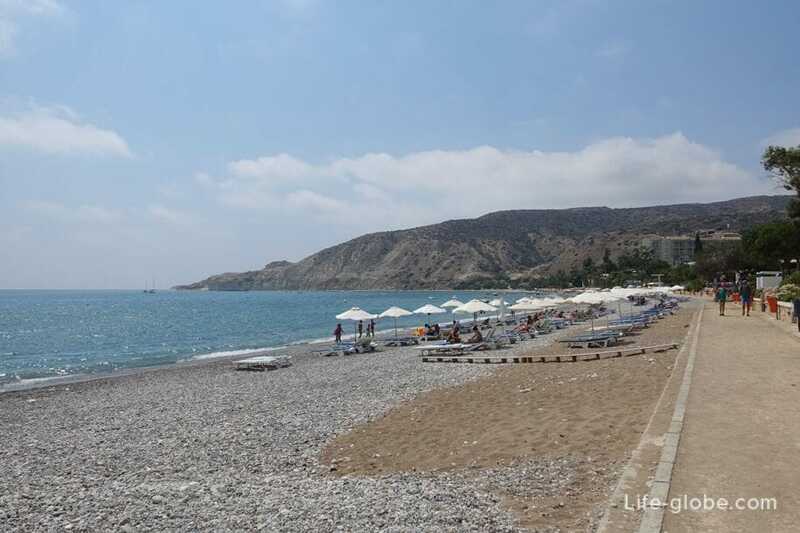 The beach of Pissouri is in the form of an open Bay. 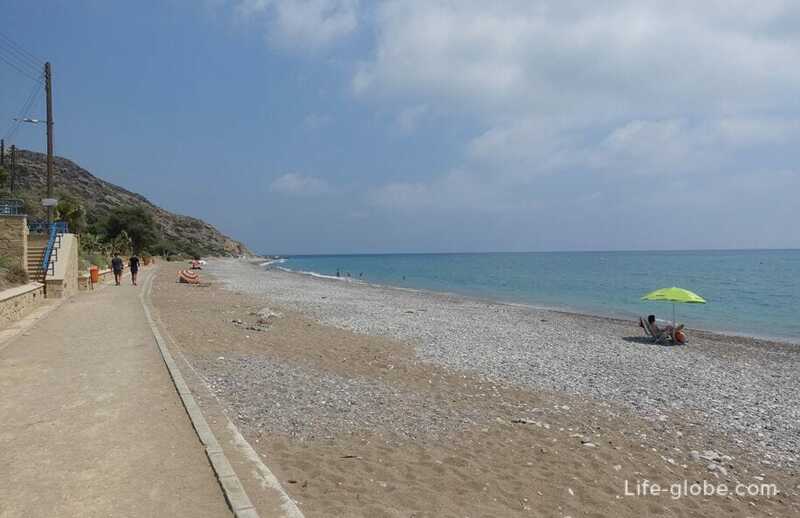 The beach is mostly small pebbles, sometimes mixed with sand, color from grey to Golden. 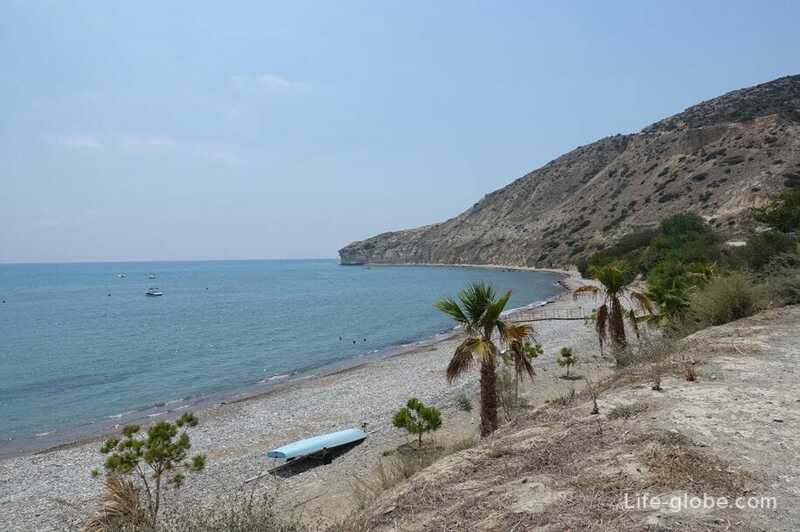 On both sides the beach is surrounded by the white cliffs of Cape Aspro (White Cape), making the beach one of the most picturesque in this part of the coast of Cyprus. 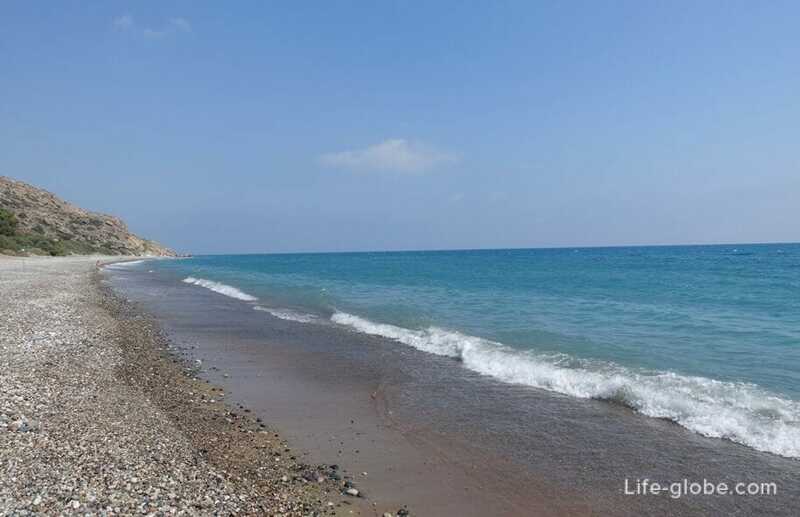 Sea water is clean and transparent, has a pleasant blue color. The beach sandy-pebble. Depth comes pretty quickly, which contributes to excellent possibilities to swim. 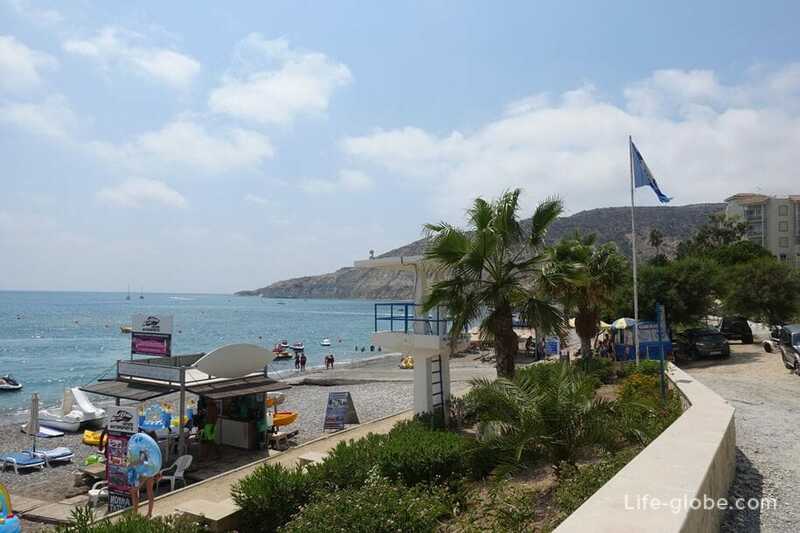 Beach amenities include: toilet, showers, changing rooms, sun loungers and parasols, and a dedicated area for water sports and relaxation, there is a zone of beach volleyball. 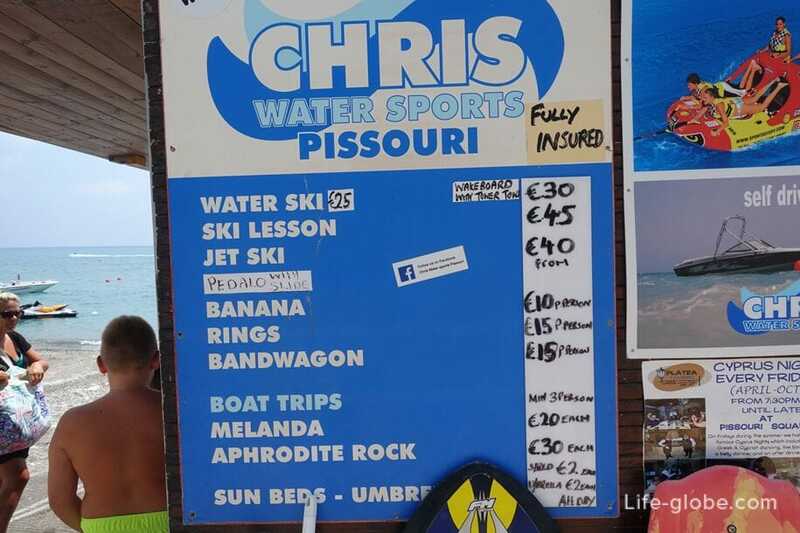 The cost of the rental of sun loungers and sun umbrellas for € 2.50. 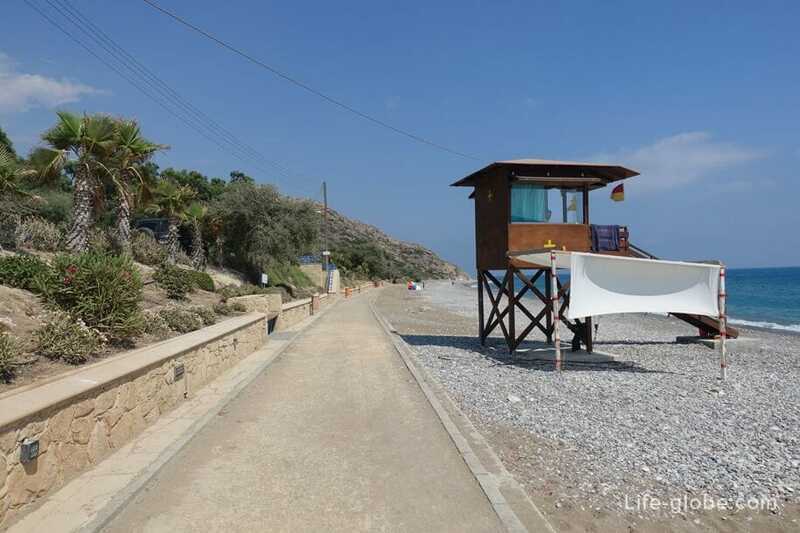 The beach has five public footpaths, two of which have disabled access. All the basic amenities equipped in the Central part of the beach, while its Western and Eastern sections remain virtually untouched. The Western end of the Bay adjacent to those occurring in sea water in Cape Asprorotos ("White rock"). 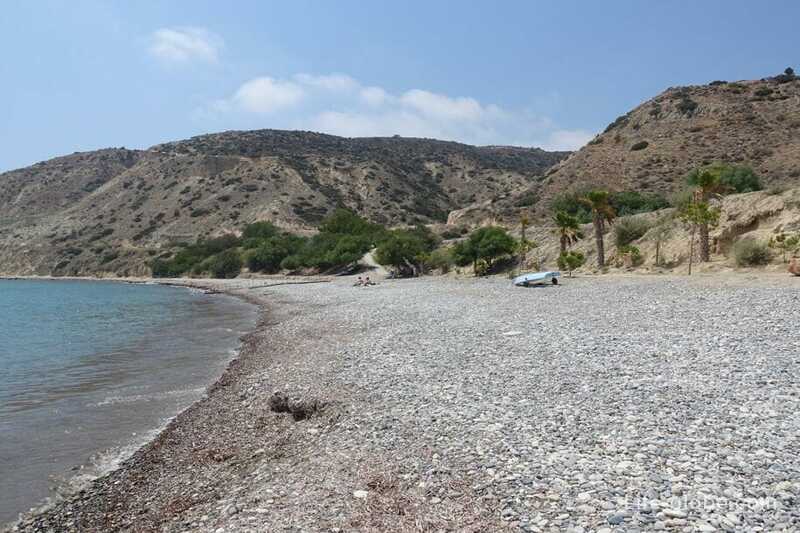 At the end of the Cape is a small sandy Cove. 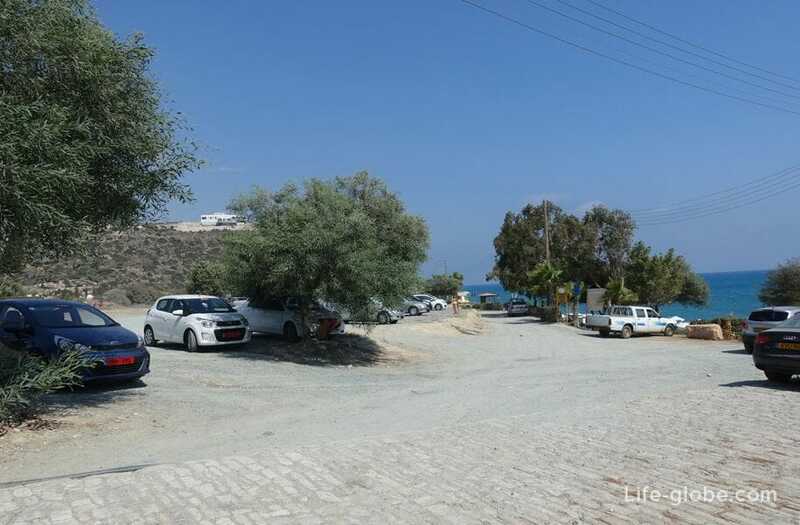 Above the beach are places where you can Park your car. 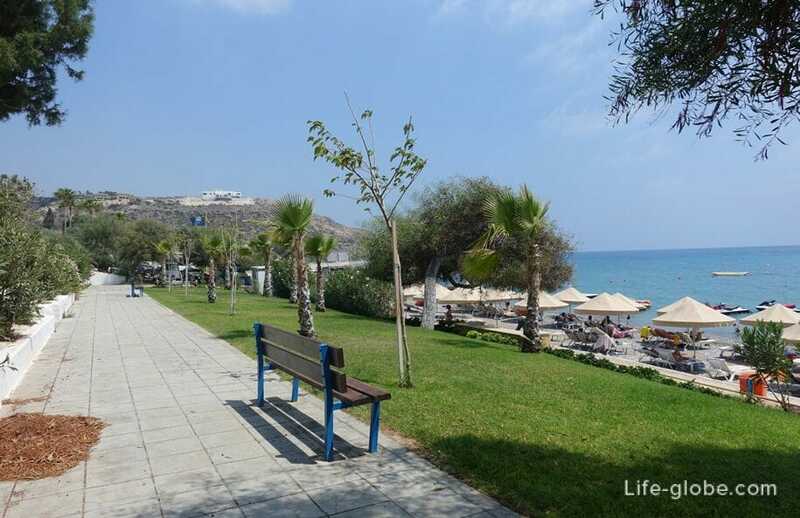 Along almost the entire Pissouri beach, a Hiking trail, she's promenade. 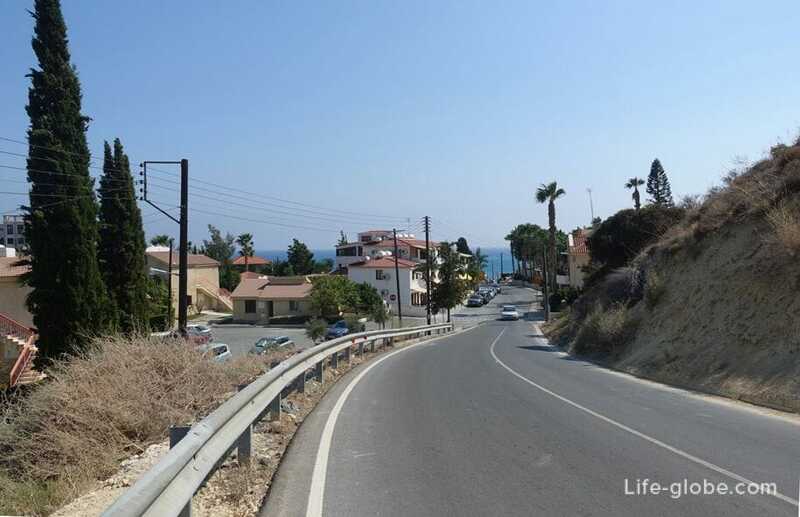 Whereas, the carriageway of the road is far away from the beach and promenade, which is also a plus for vacationers. 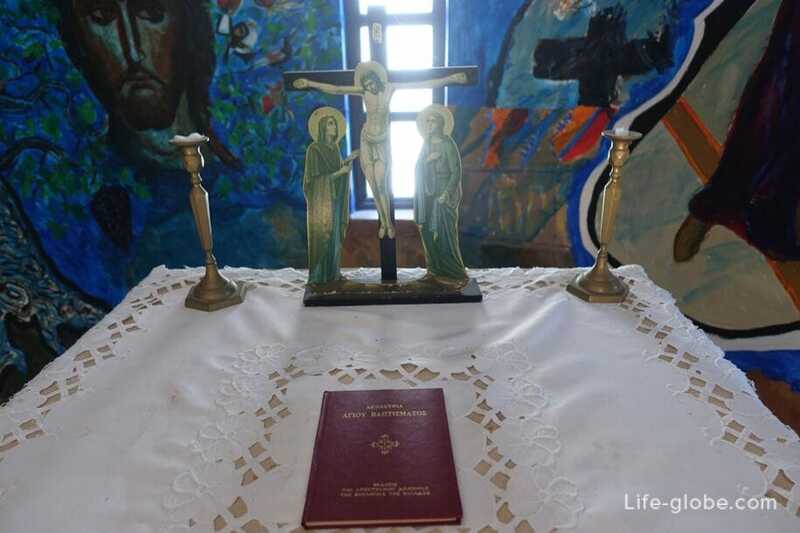 On the waterfront: places to stay, urn, a couple of cafes, tree-lined street and a small chapel. Hotels with private beach here, but there is a hotel and apartments directly on the beach and having direct access to the beach. 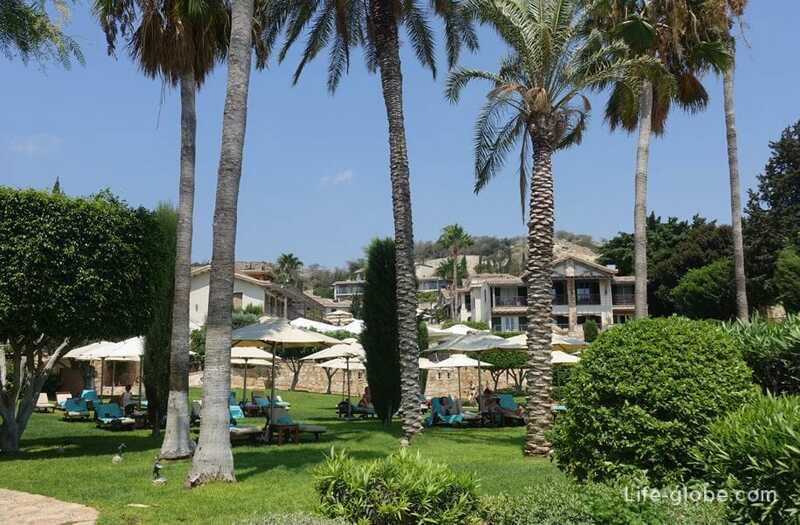 5-star Columbia Beach Resort, surrounded by extensive landscaped gardens. Featuring a 80-metre lagoon pool, 5 restaurants and 7 bars. In the room price included (optional): Breakfast + dinner or Breakfast + lunch + dinner. 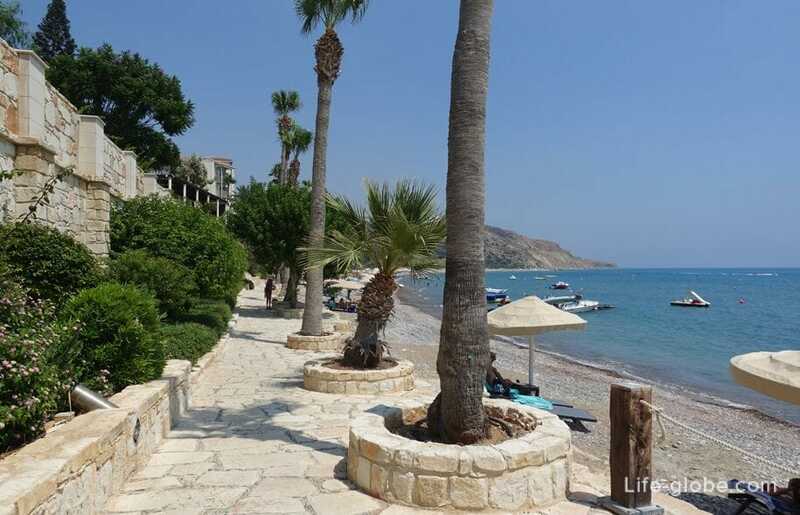 Pissouri Beach Apartments. 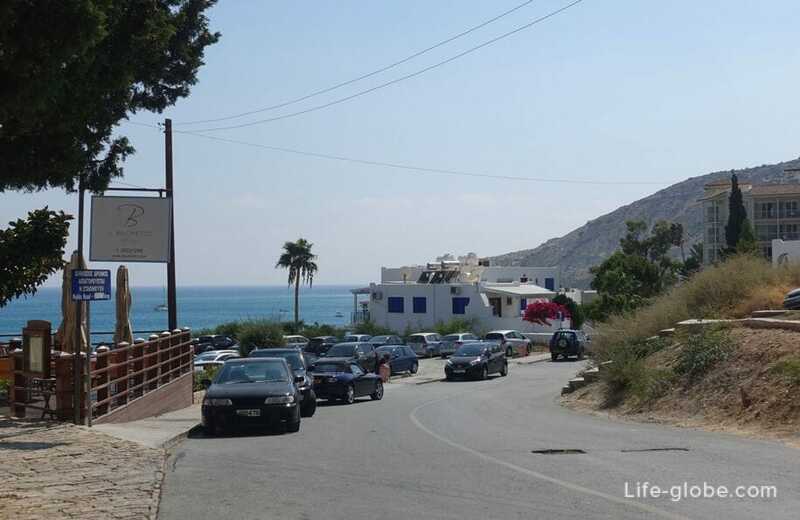 It offers self-catering accommodation with a furnished balcony with Mediterranean sea views, barbecue, tennis. In public areas, free Wi-Fi. 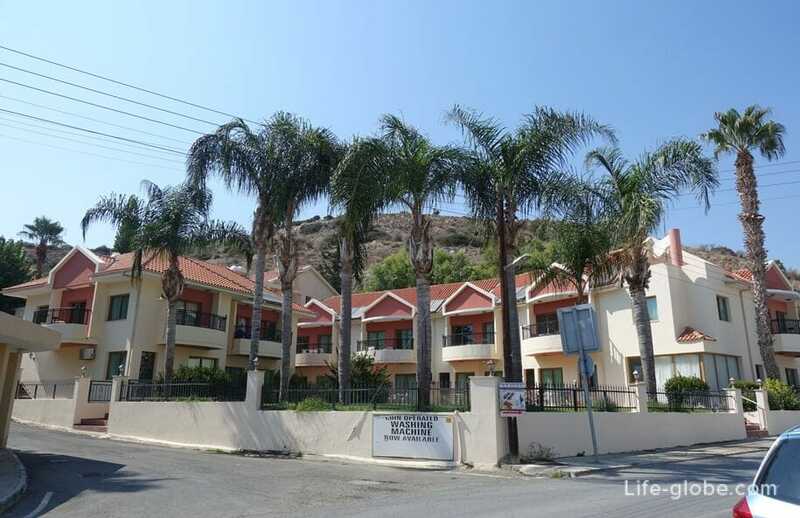 All apartments are equipped with air conditioning and a living room with a flat-screen TV and CD/DVD player. 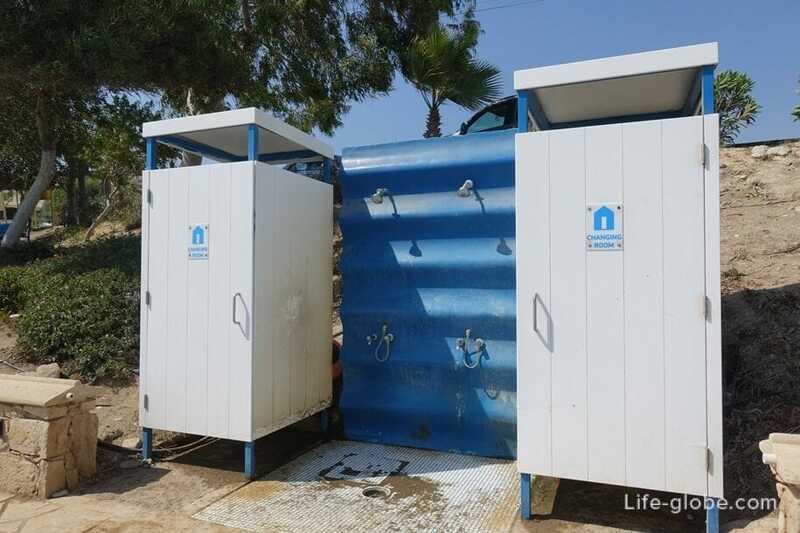 Extras include a washing machine and Ironing facilities. 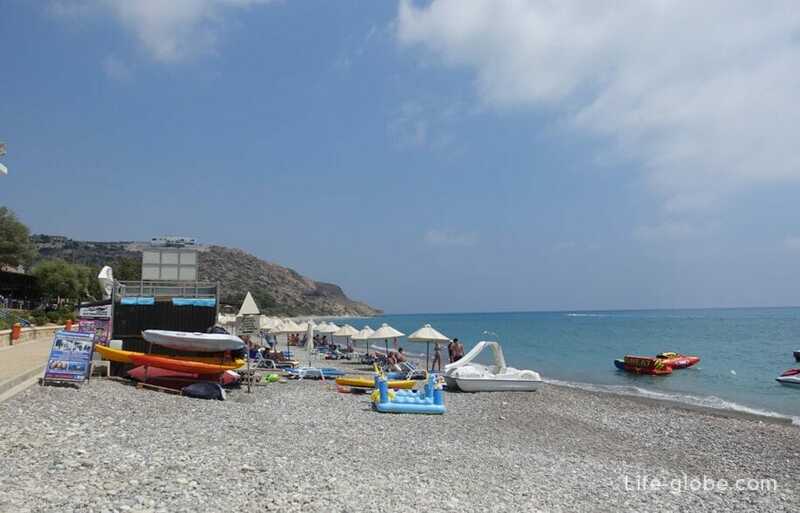 Despite the fact that the beach of Pissouri, located in the Bay refers to the main settlement of Pissouri, however, is a separate tourist area - Pissouri Bay and probation became a separate tourist resort. 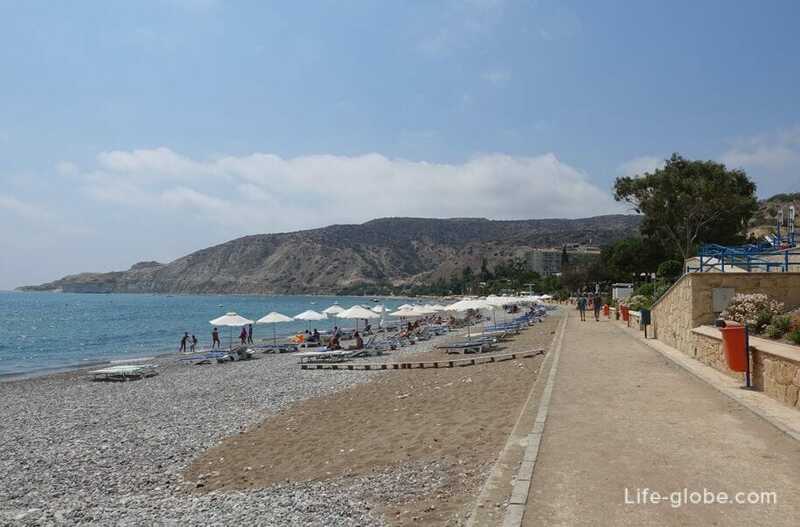 Above the beach are Kiladon and Ampelonon street, along which are concentrated the main tourist life of Pissouri Bay. 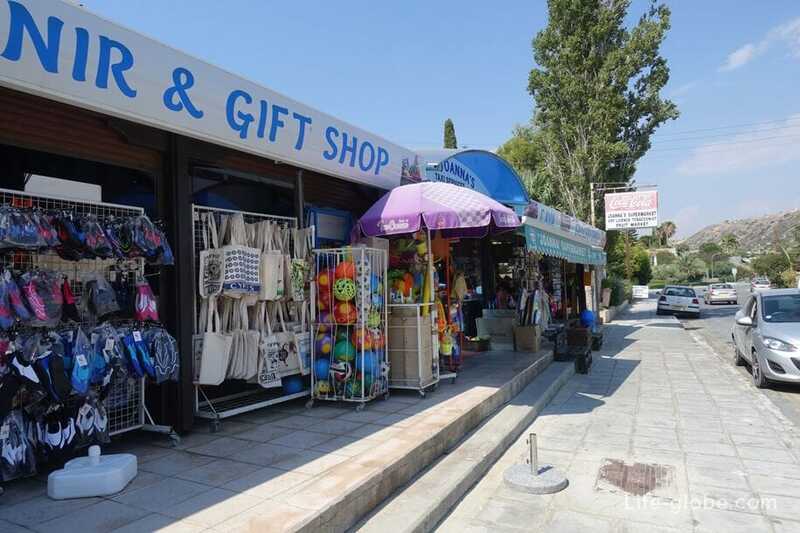 Here, souvenir shops and small shops, fruit latkes and cafes, restaurants and taverns where you can taste international and traditional Cypriot dishes. 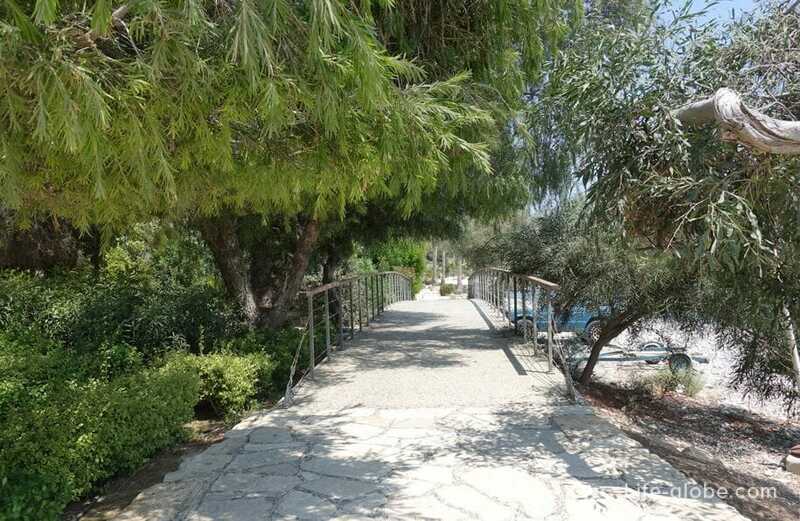 Apartments Kotzias Beach set amidst a well-tended garden. 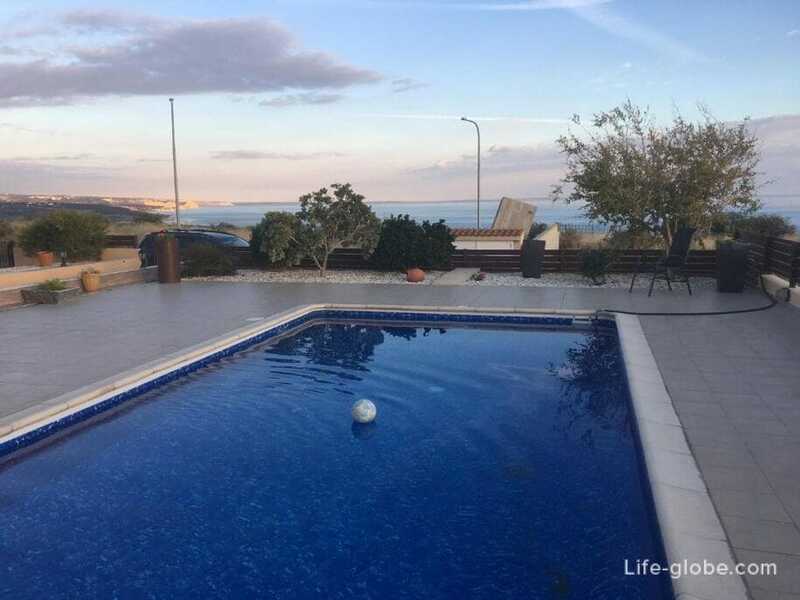 It features a pool with sun terrace and a snack bar. All apartments have a balcony. 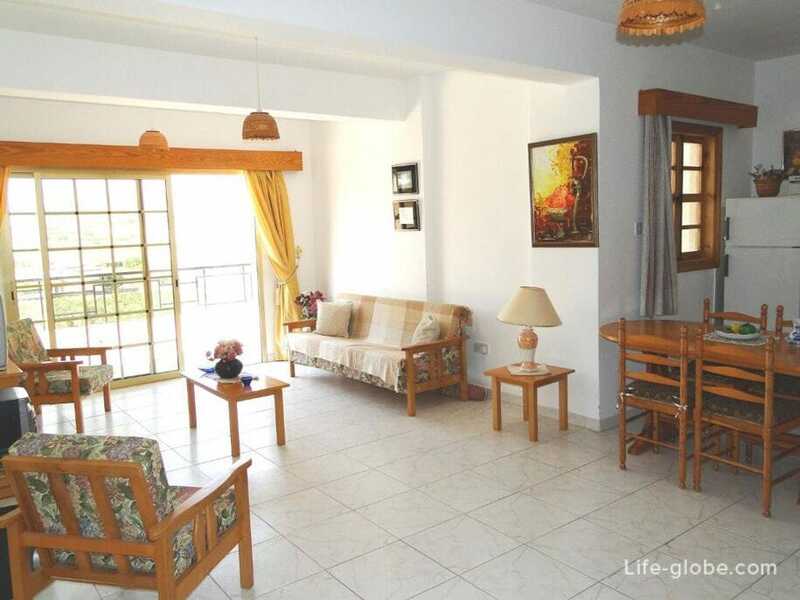 Features kitchen facilities, a Seating area, a dining area, a refrigerator, a stove and a TV with satellite channels. 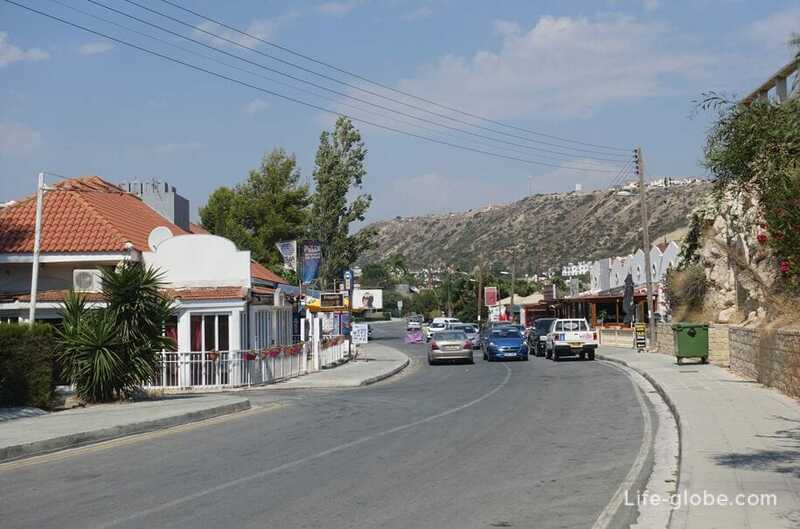 Hylatio Tourist Village complex surrounded by landscaped gardens. 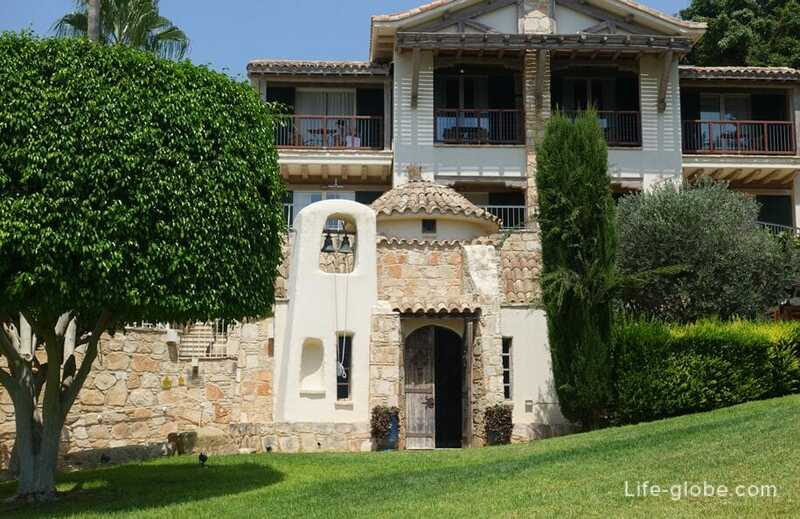 It features an oval swimming pool, pool bar, restaurant and balcony overlooking the garden. The apartments and studios at the complex have a kitchenette and a Seating area. The bathroom has a bath. Extras include an electric kettle and a mini fridge. 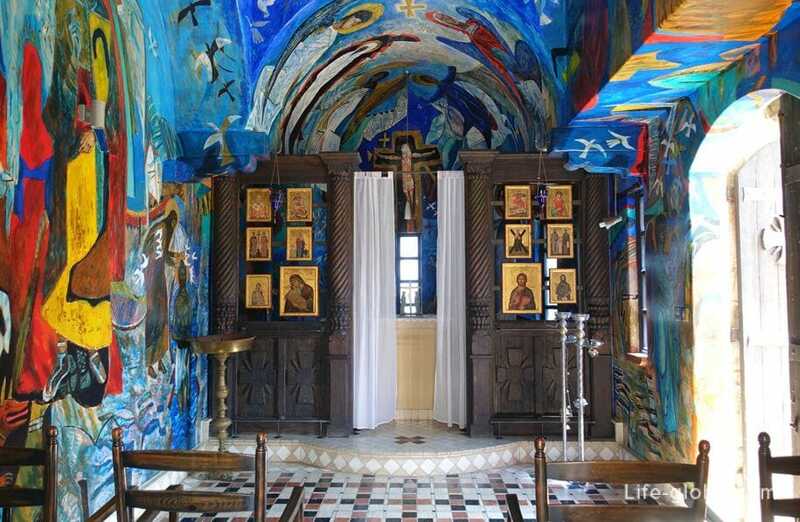 Family-hotel Ampelokipi Holiday is located in a quiet place among the vine-covered valley. 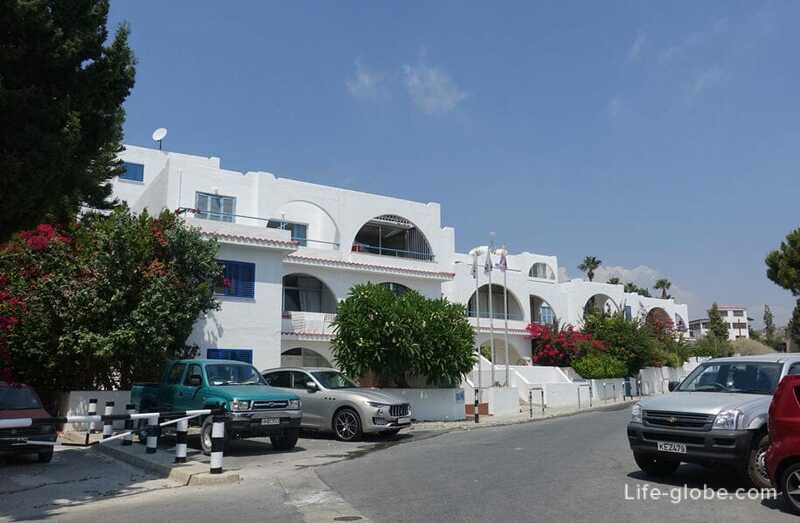 It offers an outdoor pool and a snack bar with satellite TV with sports channels, as well as apartments with a private kitchen and Billiards. 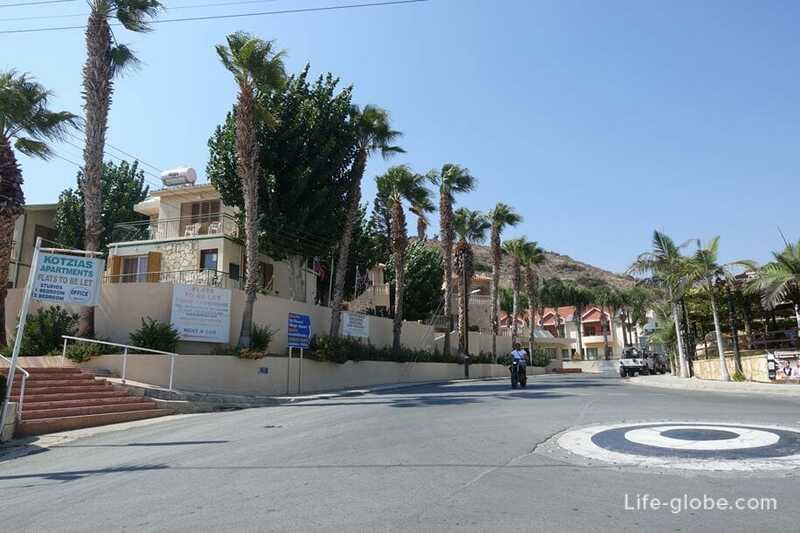 Pelekanos apartments. 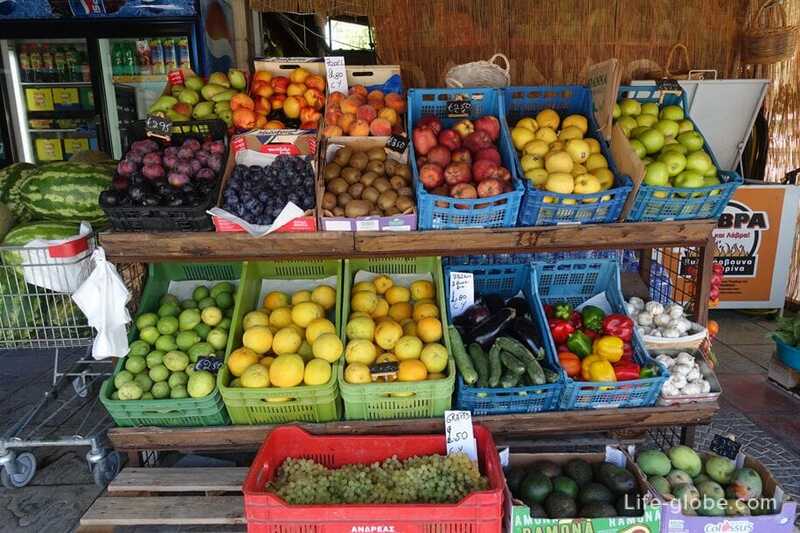 All rooms have a private kitchen, and on site is a swimming pool and a restaurant with panoramic views of the valley. Some rooms have a flat-screen TV. Bayview Villa - Pissouri Bay. 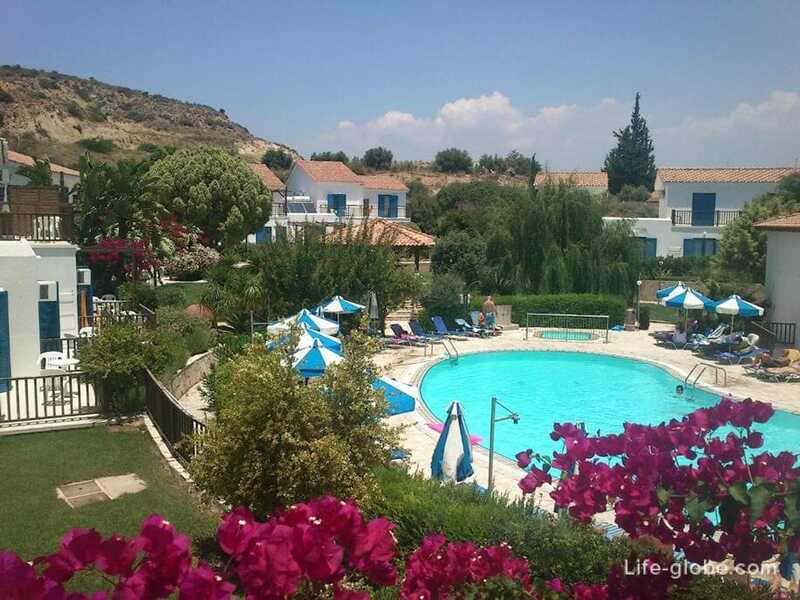 It offers an outdoor pool, a sun terrace with sun loungers, a garden and free Wi-Fi. The Villa is equipped with air conditioning and a flat-screen TV. The kitchen includes a dishwasher and a microwave. The Windows offer views of the sea and the mountains. 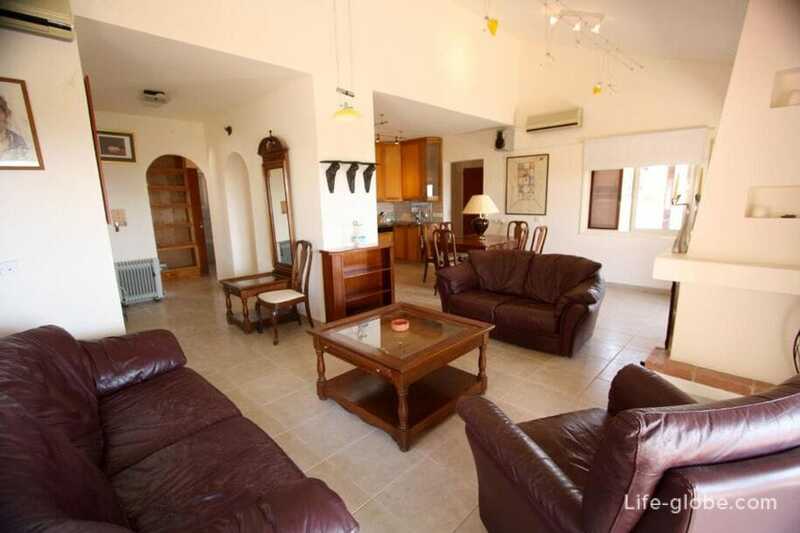 Villa Michaella offers a garden, balcony, 2 separate bedrooms and a bathroom with bath, shower and Hairdryer. 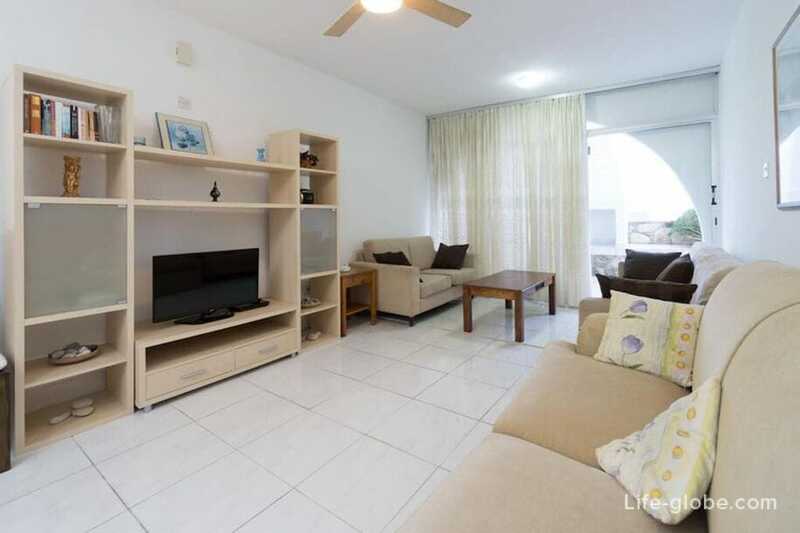 It features a kitchen, flat-screen TV and air conditioning. 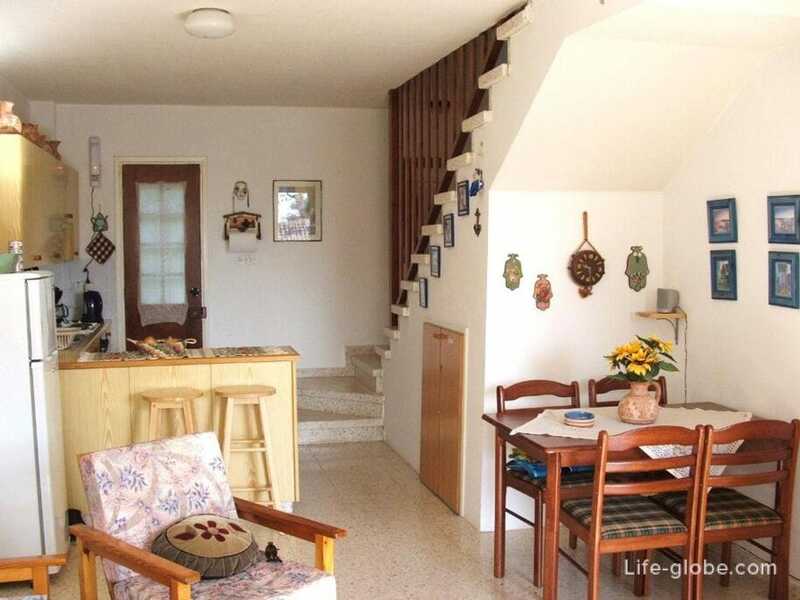 Villa Apollonia has 2 bedrooms, a fully equipped kitchen with a dishwasher and a flat-screen TV. 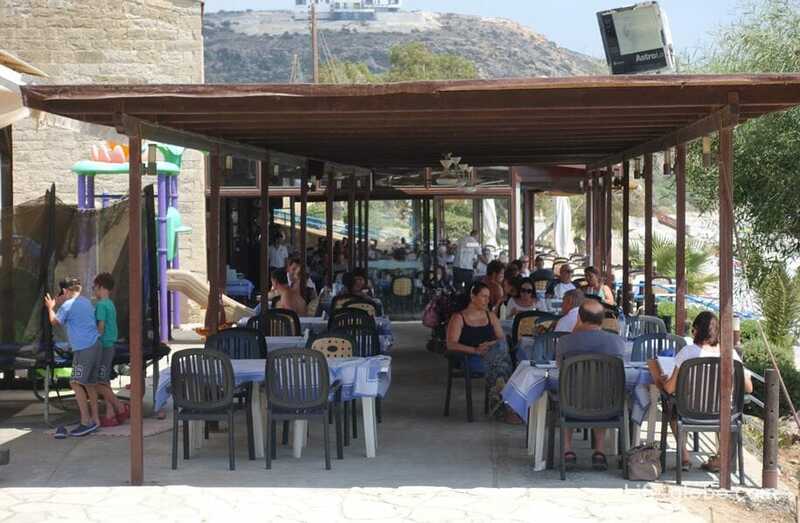 A daily continental Breakfast with a choice of dishes on the menu. 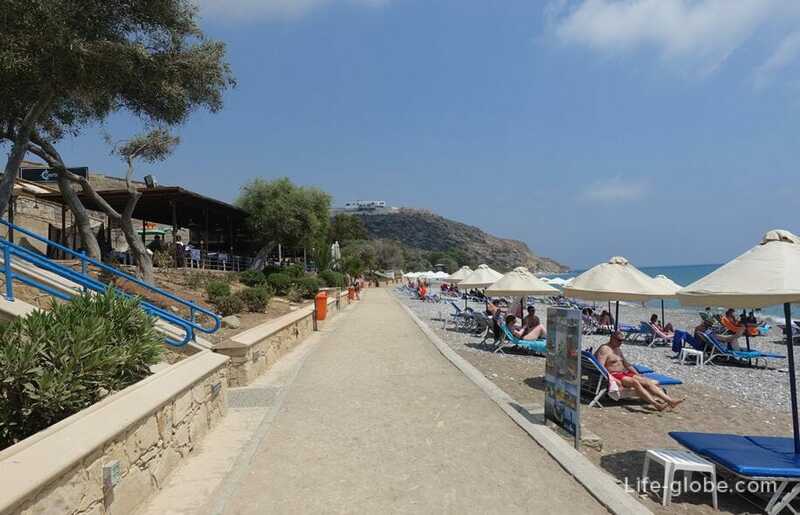 It offers a sauna, an outdoor pool and barbecue facilities. 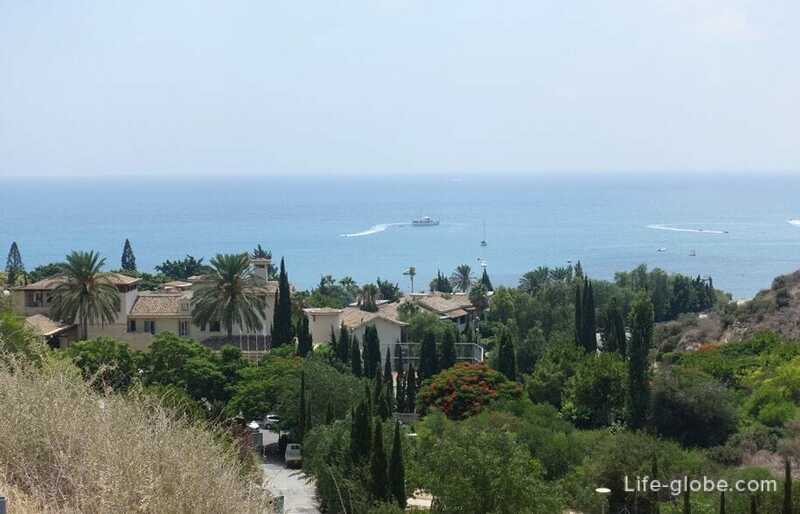 Vineland Villa Panorama with sea views located on a hill, about 2 kilometers from the Pissouri beach. 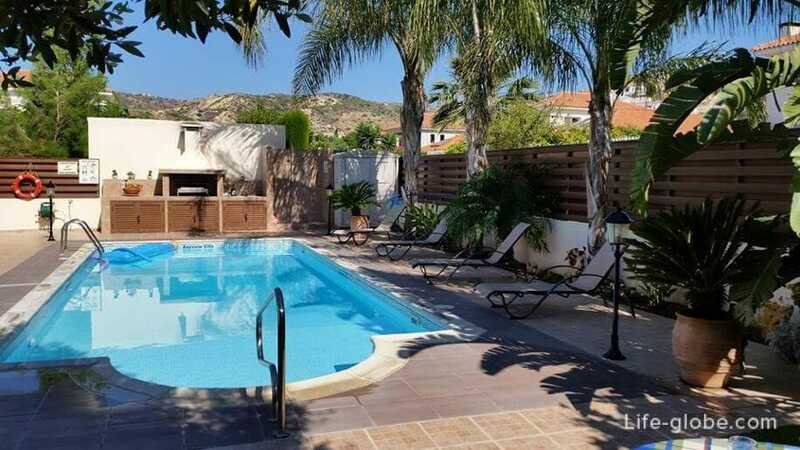 It features a private pool and a garden with barbecue facilities. 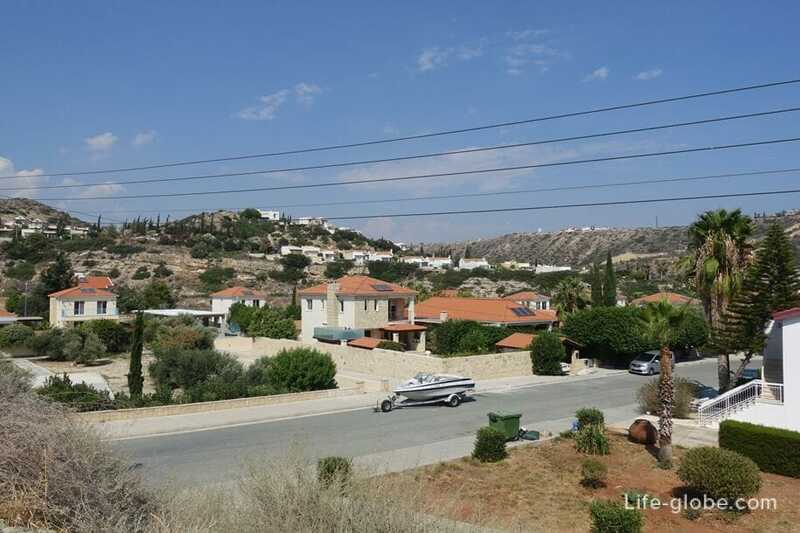 Villa features a living room and a fully equipped kitchen with a dishwasher and an oven. The room features a flat - screen TV with satellite channels. 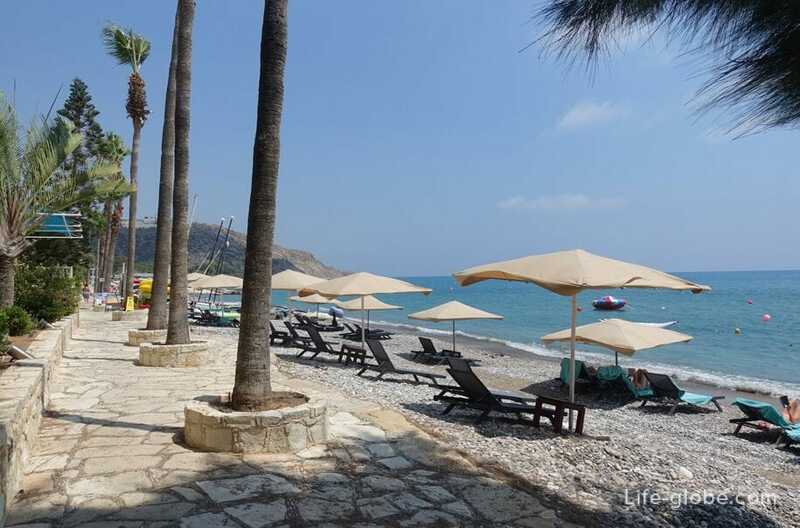 Resting in the heart of Pissouri Bay, the village of Pissouri is also worth a visit as it retains its charming traditional character. 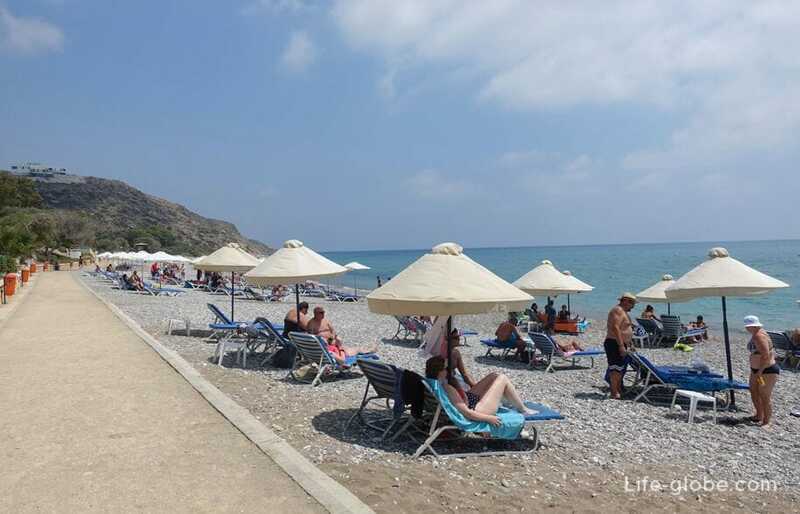 All accommodation in Pissouri can view and book here. 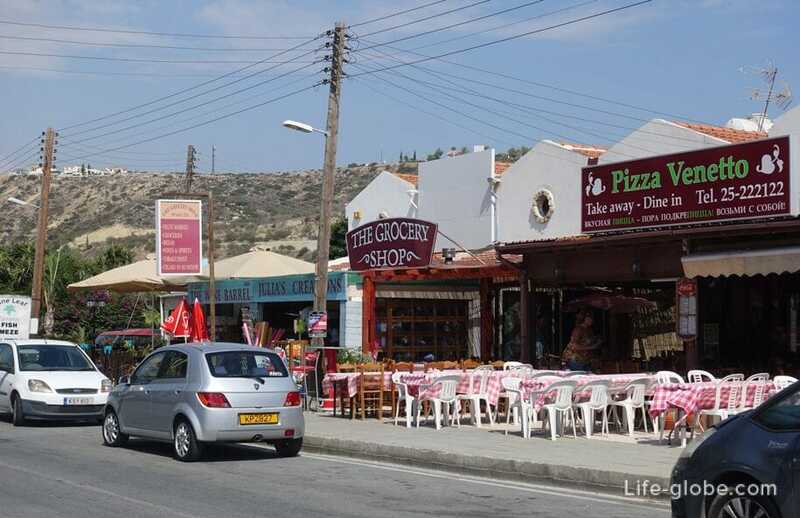 Closest to Pissouri airport is Paphos International Airport. 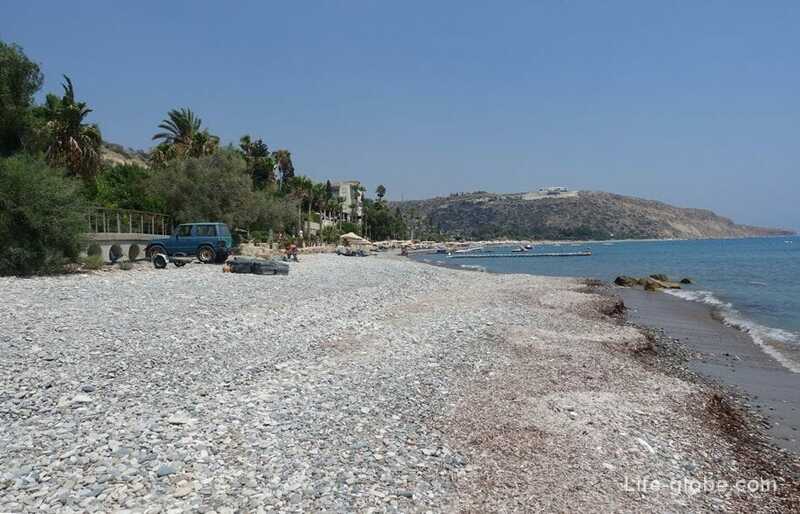 Distance from Paphos airport to Pissouri beach is 31 kilometers. 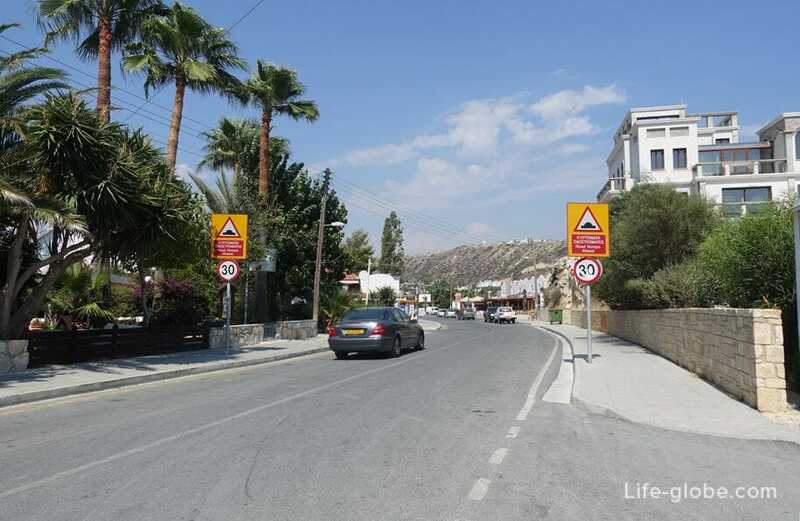 From the airport and the centre of Paphos can be reached in Pissouri by public buses, as well as from the centre of Limassol. 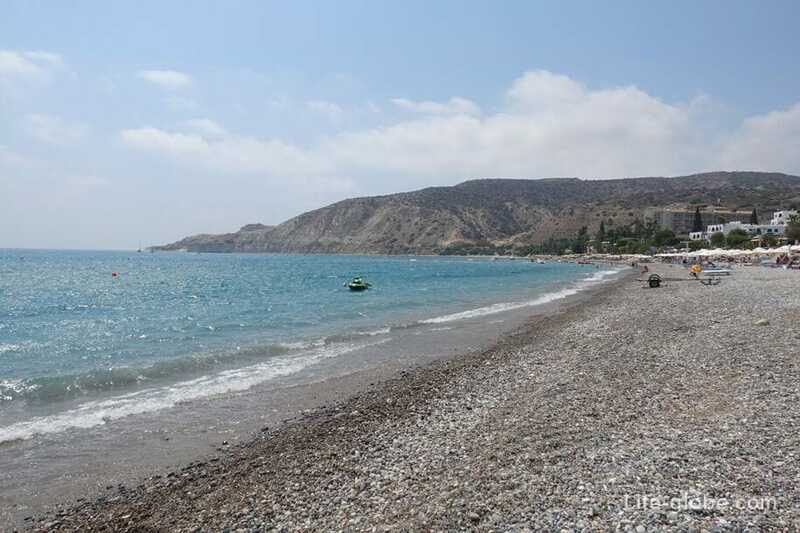 How to get from Paphos to Pissouri see here, from Limassol in Pissouri - here.